Mid-October, and summer projects lay flattened at my feet, deflated and tiresome. The tomatoes not planted, the crab feast not hosted, the badmitton net still in its carrying case, the pedicure unscheduled, the sides of my knees never carefully and cleanly shaven. Time to officially abandon them all. But one such project I’m determined to finish today. Ever since March when Professor Dean Rader in the New York Times named Pablo Neruda as the greatest poet of all time, I knew I had to poem elf him, even though I’ve always found Neruda inscrutable. 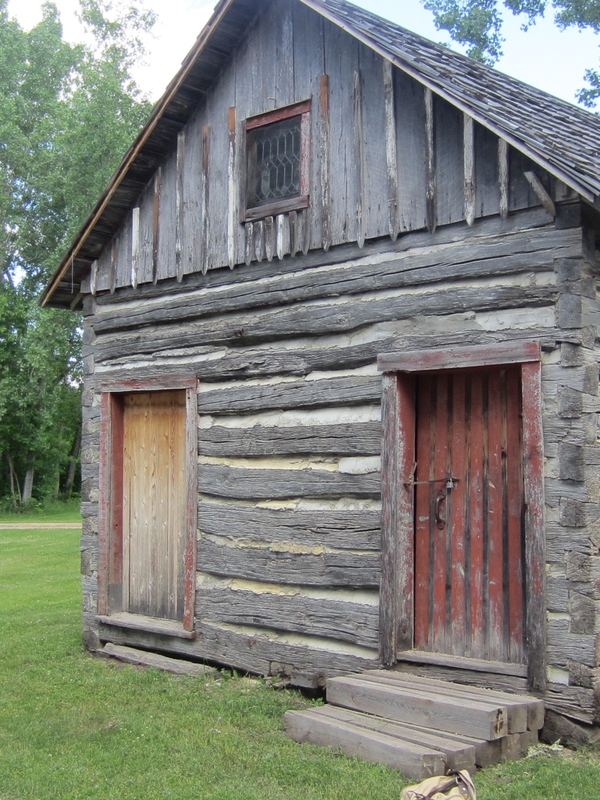 Last June I placed “Ode to Age” on a 150-year old barn in Shakopee, Minnesota. And all summer and half into fall I’ve put off a careful reading. So here goes. “Ode to Age.” Er. Uh. Yeah. Okay I don’t get it. Neruda obviously doesn’t value clarity as much as my man Billy Collins. Or else this poem highlights an underdeveloped part of my brain in the same way moving furniture does. Let me break it down then. I get the first line. I don’t believe in age. Could be on a birthday card underneath a picture of old people tap dancing or canoodling on a merry-go-round or jumping on a trampoline (diapered, of course). The second stanza, I get that too. 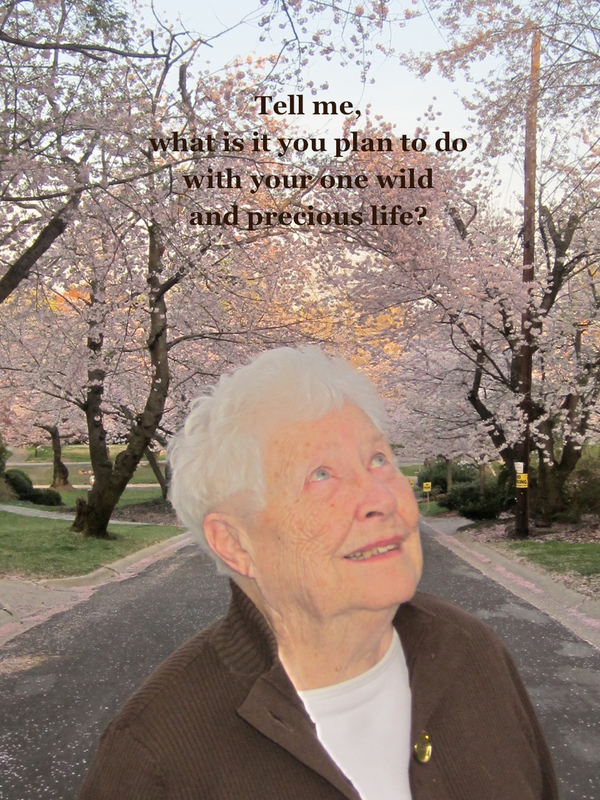 Here’s a picture of my beautiful mother (the poem is one of Mary Oliver’s) that’s a good visual representation of the child-like joie de vivre that Neruda says can exist at any age. I start to get lost in the third stanza. Neruda switches out the expected measurement for age (months, years) for that of distance (meters, kilometers). How far have you lived and how long have you wandered? Is this just a novel way of saying, it’s not how long you’ve lived, but how well? By the fourth stanza I’ve lost my foothold, and I haven’t even gotten to the ladder with treads made of air that appears in the fifth stanza. What does that mean? I’m really asking. I keep banging my head against these lines but the door is jammed. Please help before I give myself a poetry concussion. I try to understand by looking up words I don’t know. Petiolate flower is a flower with leaves that have stems attached to the stalk. Not sure how that makes any difference. Then I turn to the images. We have a flower, the earth’s mantle, and a bird. The first dies and comes back to life each spring, the second has existed for billions of years, and the third lives and dies as we do. So what he’s trying to say is . . . again, help wanted! On to the troublesome fifth stanza. Either Neruda is off and running on a surrealistic jaunt or he’s purposely mixing metaphors to confuse his readers so much that they are propelled out of conventional ways of looking at time and age. What I get from it are questions, which is sometimes what poems do. that is, are “metal or bird” the appositive of “time,” and are “time” and “flower” the subjects of the verb “stretch”? Why wouldn’t “flower” also be part of the description of time? Will I ever just give it a rest and go fishing instead? I get the general drift. Let’s not measure our life by time but by what we’ve seen and experienced along the road. 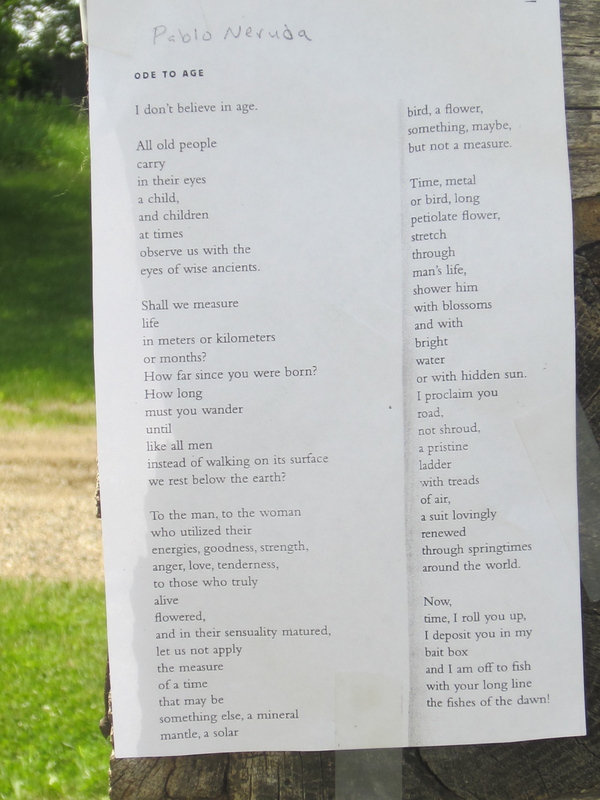 Neruda will only compose an ode, a song of praise, to age if he re-defines how age is measured. And in the end it’s better to go fishing than to worry about being old. 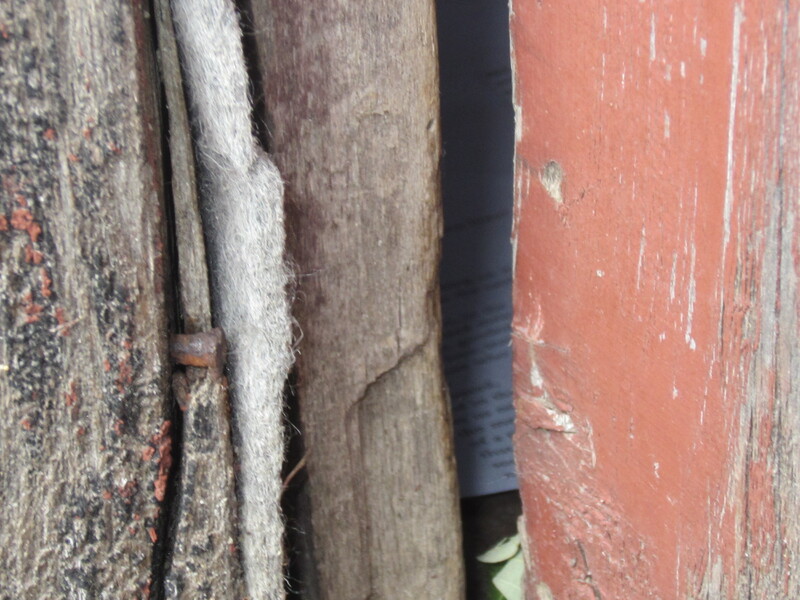 I thought I was being artistic or at least clever when I carefully placed the poem half in and half out of the doorway of this historic building. When I released the poem from my fingers, it was sucked inside the crack with an unexpected whoosh. I couldn’t get it back. Should I make something of this strange event? The inaccessibility of the poem? The old age of the building/tomb? Nah. Enough is enough. In the words of Billy Collins, “beating it with a hose/to find out what it really means” is not what reading poetry is all about. P ablo Neruda (1904-1973) was born in Chile and published poems at a young age, despite his family’s disapproval. He was active in politics, serving in diplomatic posts abroad, and was elected as a senator. Imagine, a poet who’s electable! He was a lifelong communist who had to live underground for two years when a right-wing government outlawed communism. He later escaped Chile through the mountains. At the end of his life, he helped elect his friend Salvador Allende as president of Chile. Neruda died days after dictator Pinochet came to power and murdered Allende. Pinochet tried unsuccessfully to outlaw public mourning for the beloved poet. Gee, poets in other countries sure have exciting lives. 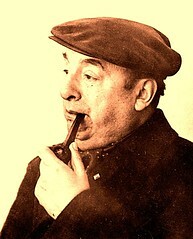 Neruda’s poetry has been translated into every major language, and he won the Nobel Prize in 1971. His influence on 20th century poetry worldwide and his experimentation with poetic forms have given him the name of the Picasso of Poetry. Clearly I have to give him another shot. I’ll try again later with another poem, a different ode or one of his love poems, one that I have an emotional connection or response to, even if I don’t fully understand it. One more thing: I’m done with long poems. Just doesn’t work in a blog format.